We woke up on Saturday morning and looked out the window. The sun was getting high in the sky because we had a bit of a late night out in Patong Beach the night before and had slept in well past morning. A perfect beach day, we thought, and then tomorrow we will catch a boat tour of the island. Then in a split second the sky went dark and opened up on us before we could even roll out of bed. Welcome to rainy season in Thailand. By the time I got downstairs it had stopped. In a flash the rain had come and passed. This is good I thought. Tomorrow it might rain for a second but we can still catch a tour! The manager at our hostel showed me the weather forecast for the following day. 100% chance of rain. In his words, tomorrow was going to piss on us. Despite his hesitations, we vowed to wake up early on Sunday, no sleeping in, and check the weather again. We got up dreary and confused at 7 AM the next morning and to our joy the forecast was 75% chance of rain instead of 100%!! And the amount of rain that was supposed to fall had dropped from 10mm/3hours to 5mm/3hours!! Yep guys, I’ve become a weatherman and read sailing forecasts now all thanks to our hostel’s manager. 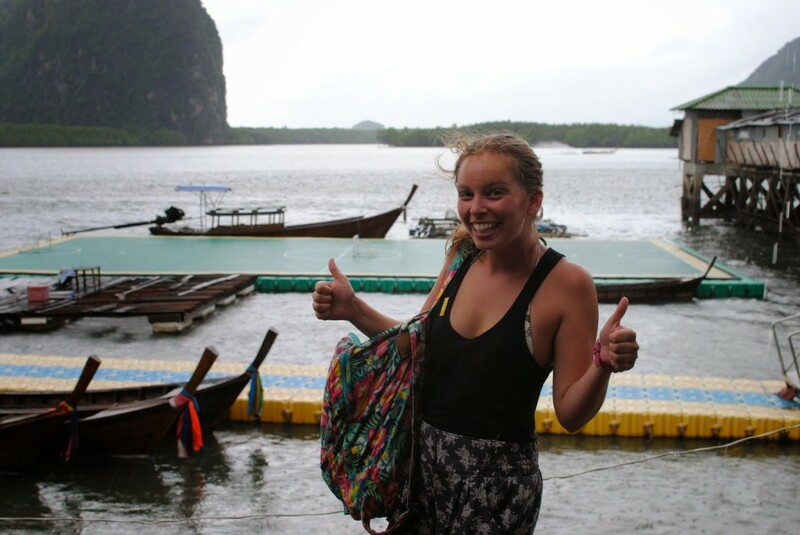 We called up Phuket Direct Tours and by 9:30 AM were on their shuttle service heading for the Monkey Temple. 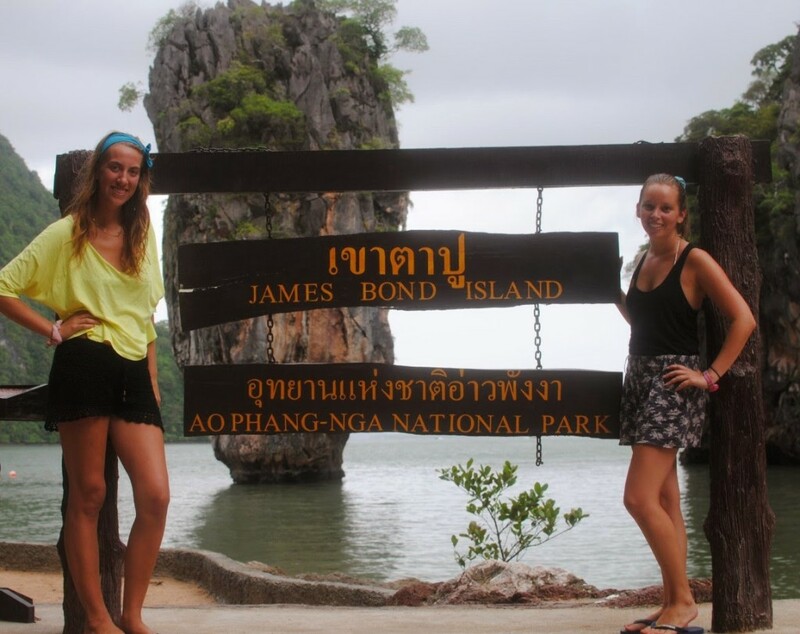 Now we had read all The Londoner’s posts about her visit to Thailand and there were two things we really wanted to do when we got the chance to visit Phuket: find the Monkey Temple and take a boat tour to James Bond Island. We decided to book this tour because it included both. Phuket is a very big island so it took about an hour and a half to pick everyone up and arrive at the Monkey Temple. Along the way our tour guide explained the day’s itinerary. 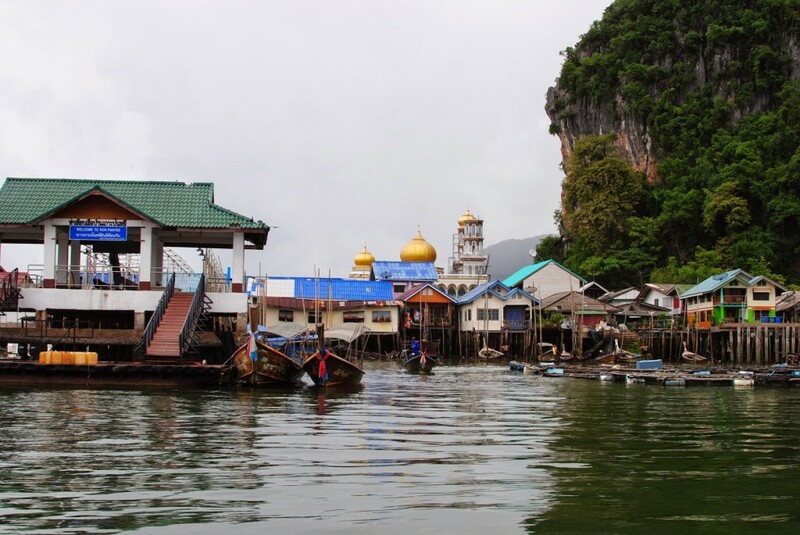 The temple, a Muslim fishing village, James Bond island and canoeing. One of the French girls in the minibus was not down to canoe. Our guide who was appropriately named Happy smiled a big smile and assured us all, “Very popular to canoe, no one has ever died!” Very reassuring. 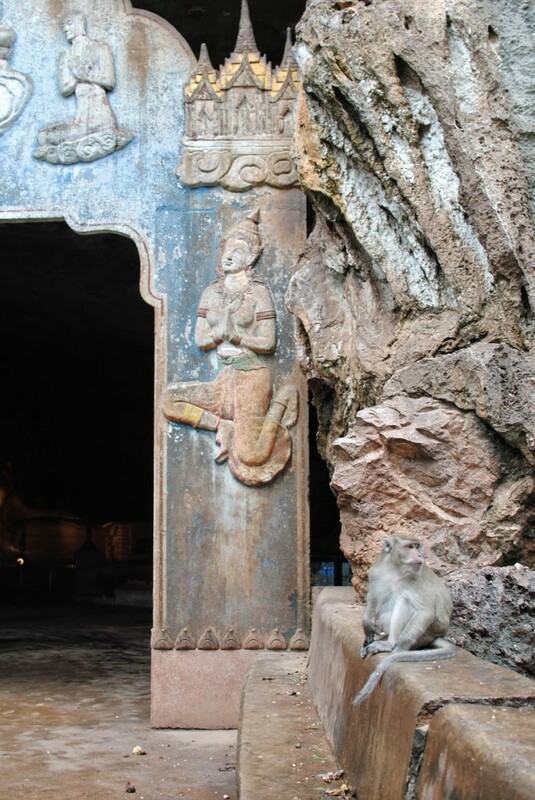 When we arrived at the temple, our tour guide briskly waved us past the monkeys, “No monkeys now, picture of Buddha image then monkey later!” The entrance of the temple is decorated with old carvings in the stone that you walk under as you enter the cave. Inside its cool and dark other than a few lights shining down on the many Buddha images. 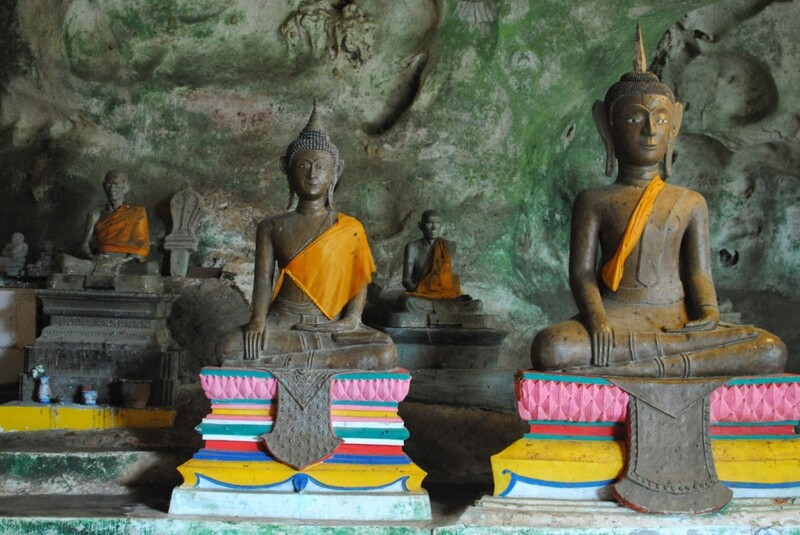 The statues at the front of the cave are brightly decorated with color but as you walk through, the surroundings fade to gold before you escape color almost entirely and are surrounded by the dark grey green of the limestone caves. 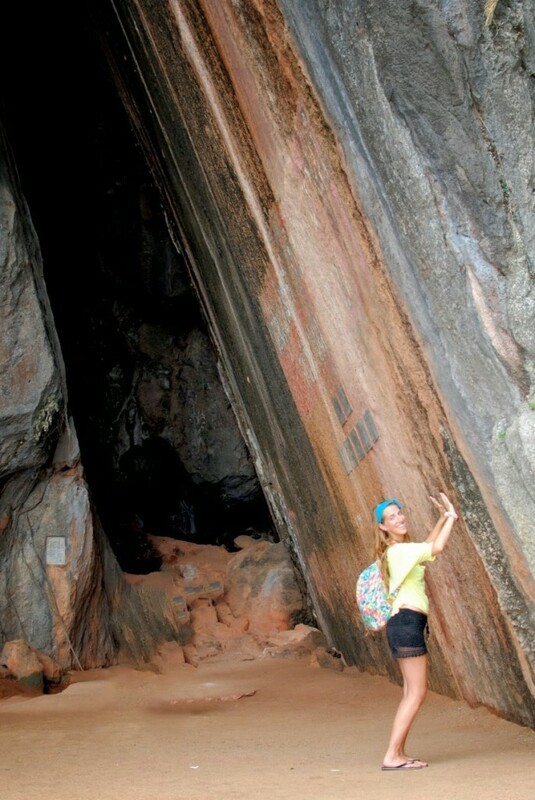 Beyond the main section, is a small garden that lasts only a moment before you are directed back into the caves. 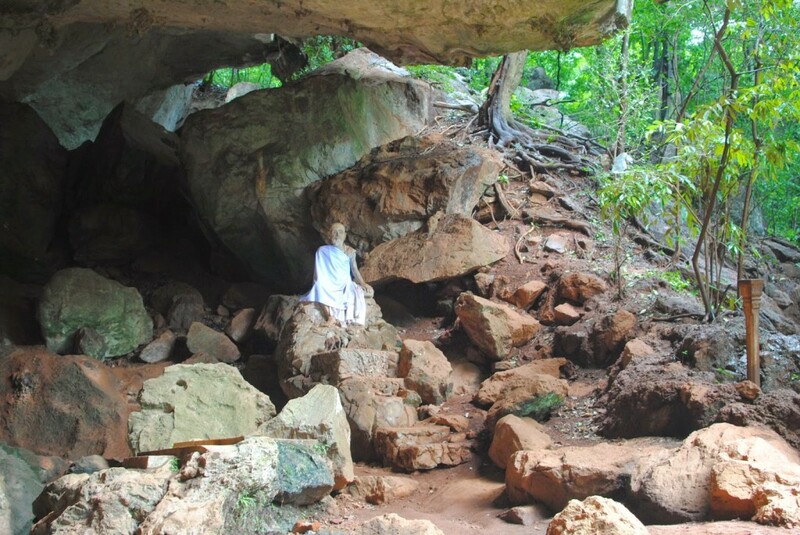 The second cave is filled with wet golden and green stone, completely quiet save for the screech of a few stray bats. 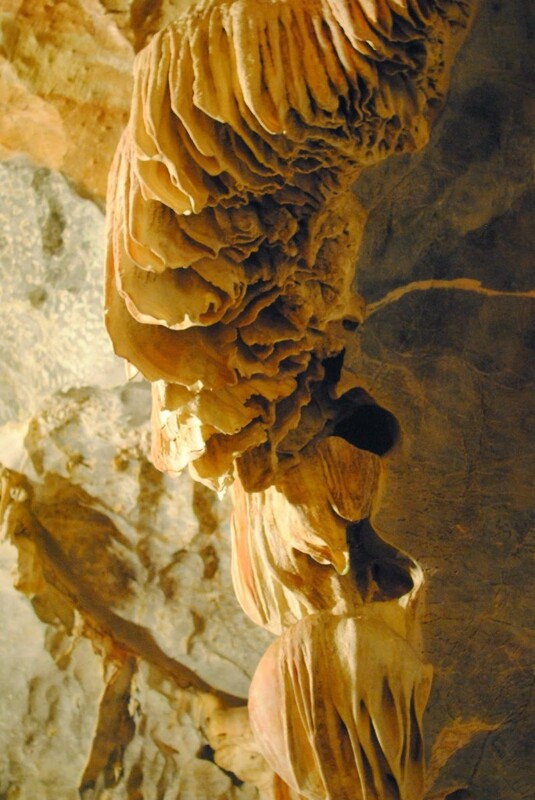 It’s pretty amazing to try to figure out how the rock formed into such intricate shapes. 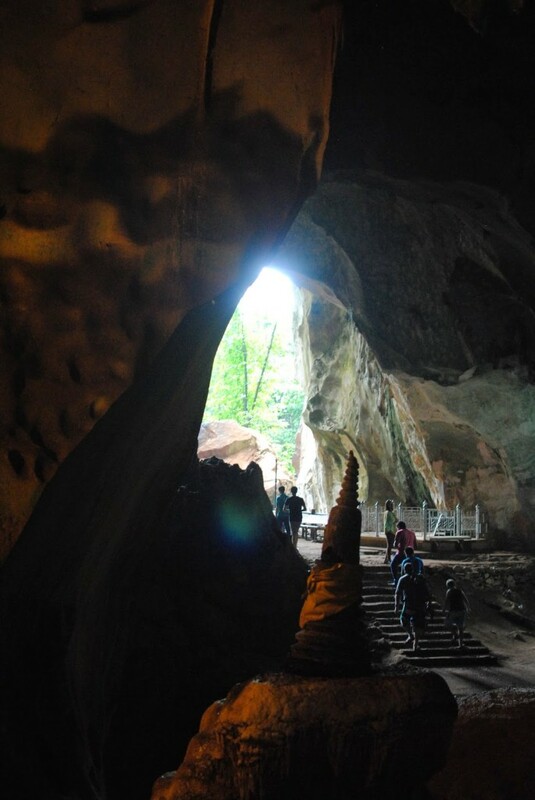 We took a few moments to look around before heading back to the front of the cave to meet the monkeys. 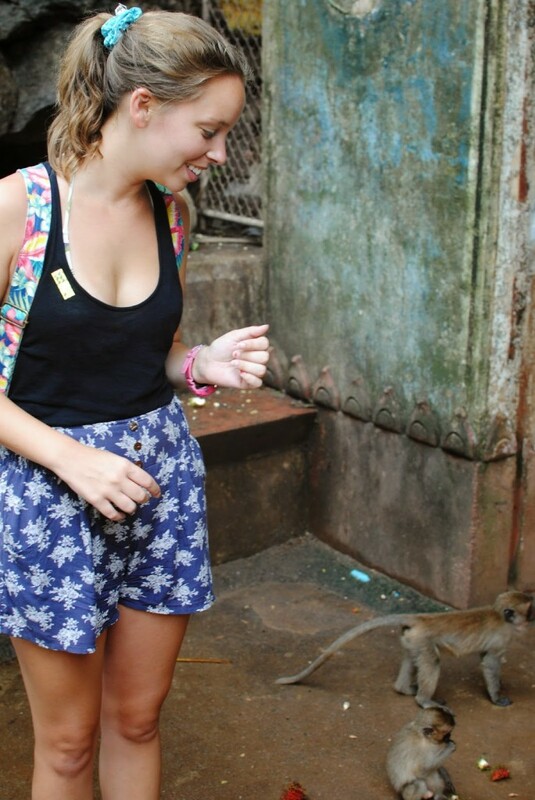 A few tourists had bananas and a group of monkeys jumped onto them screeching. Within seconds all the bananas were gone and the couple was left covered in mud. Maggie and I decided to stand back and watch. 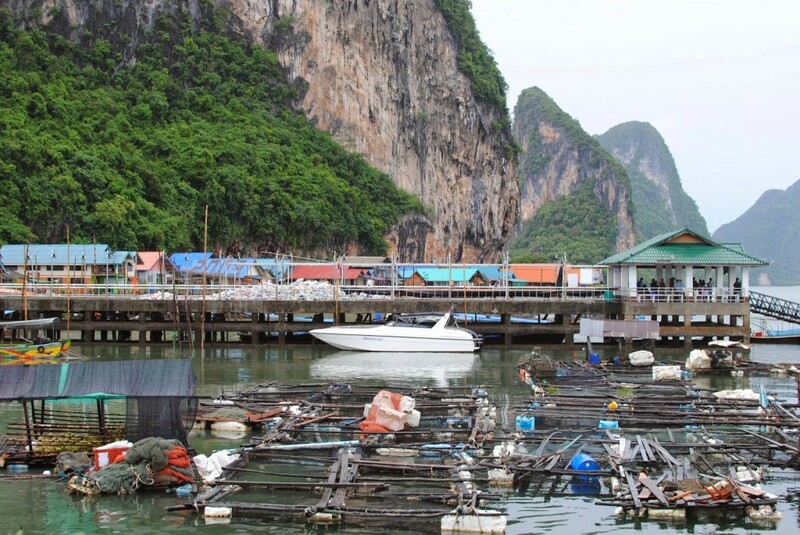 We transferred from the minibus to a modern version of a Thai longtail boat and set off for Panyee, the floating Muslim fishing village where we would eat lunch. We were ushered onto the village right before the rain began and were lucky that much of the village is under cover. Lunch was less than notable but included in our tour. We ate up quickly so we could explore the village. Right when we thought the rain would stop us, it let up and I spotted a sign pointing in the direction of a “floating stadium.” I had a minor freak out as I realized I was standing on the same floating village from this video my mom’s friend shared with me and set off at a run through the rain. 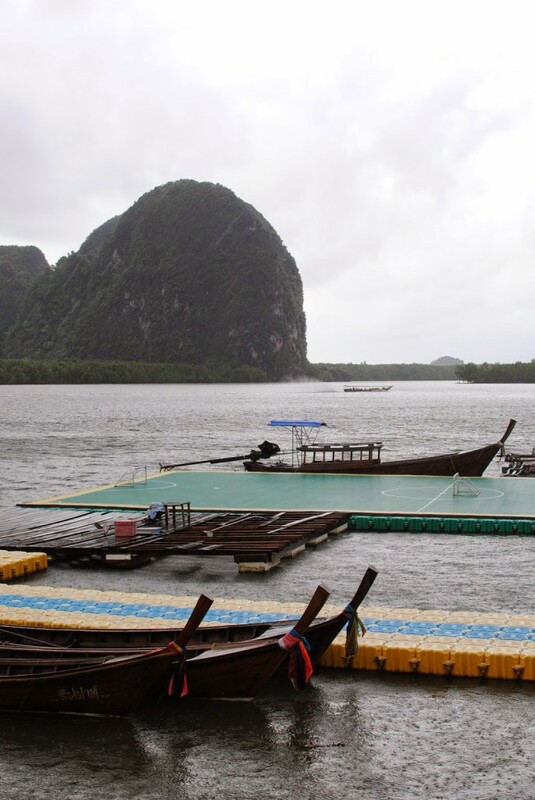 We found the Panyee floating stadium! We had five minutes until the boats loaded but I was determined to find the stadium and get a picture of it. Anything for a photo op, right? We made it back just in time to hop on the boats. 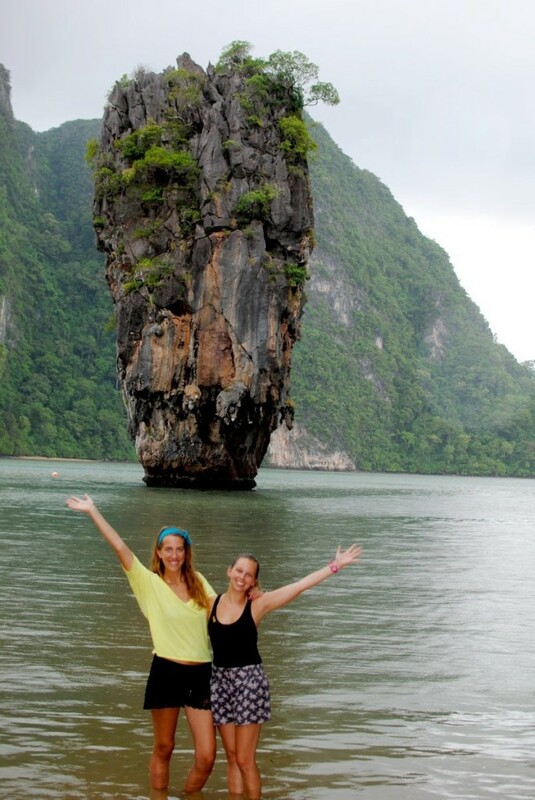 The weather had cleared so we decided to canoe first and see James Bond island last. Our paddler was a little teenager from Panyee and was not only great at steering us around, but also a pretty enthusiastic photographer. 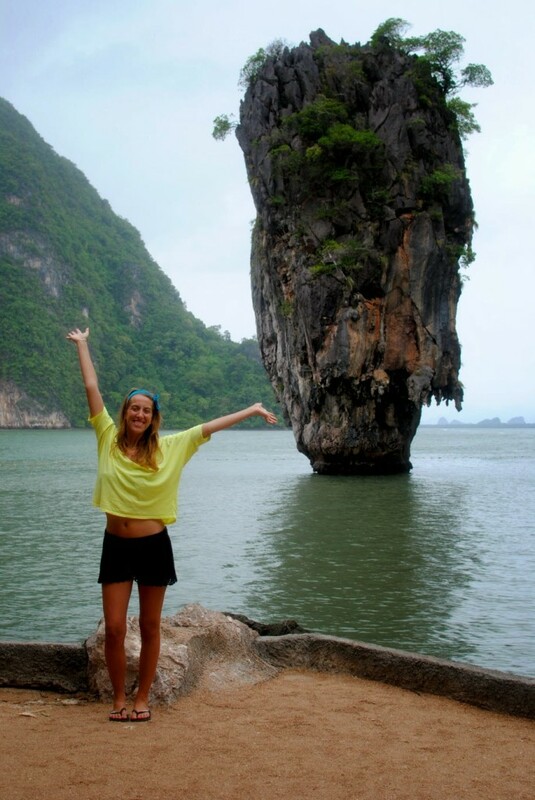 Back on the boat, we sped off for James Bond island, famous for its role in “The Man with the Golden Gun.” The island was just one of the many in the area formed by exposed underwater caves but this one with the iconic rock was worth the hype. Not worth the hype? 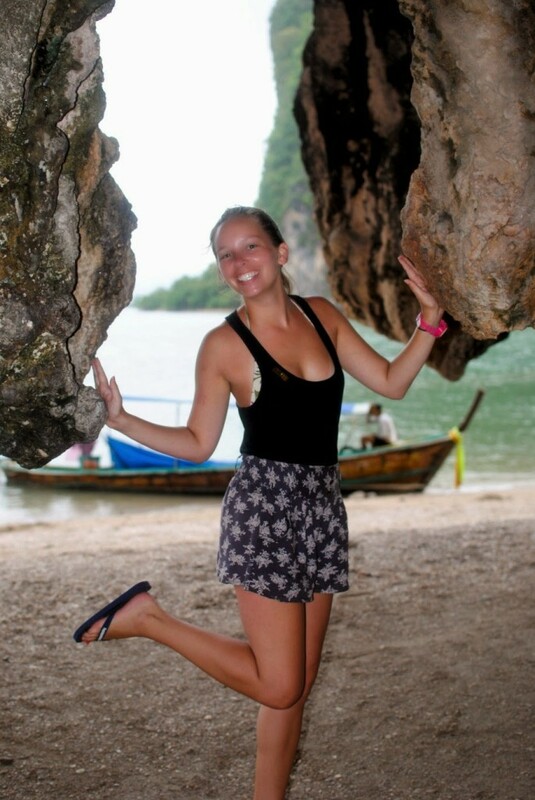 The pushy, rude tourists elbowing their way into every corner of the island for a picture. I cannot imagine this place during peak season. Aside from the James Bond rock, there is also a leaning rock that fell at some point in time and is now propped up by another rock Maggie. It’s massive and makes for a very interesting sight. Despite the intermittent rain, and even the short lived down pour at the fishing village, we had a great time. 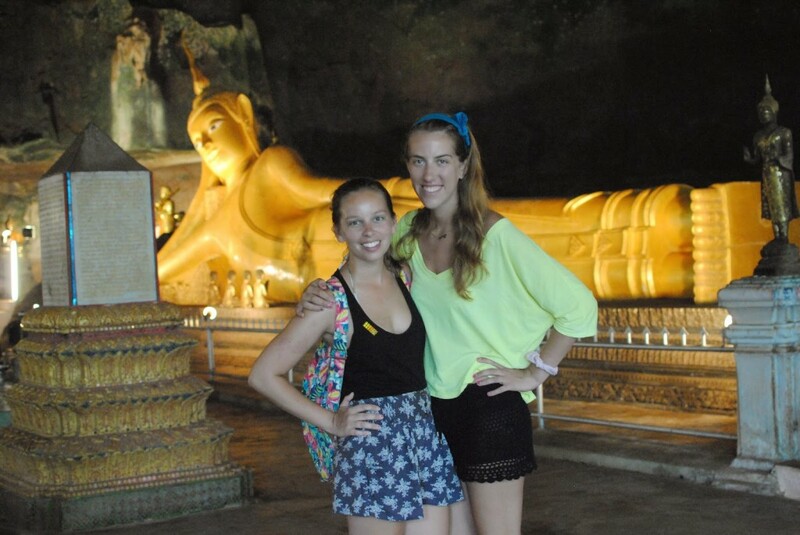 This tour was inexpensive at 1100 THB and included all of the sights we wanted to see. 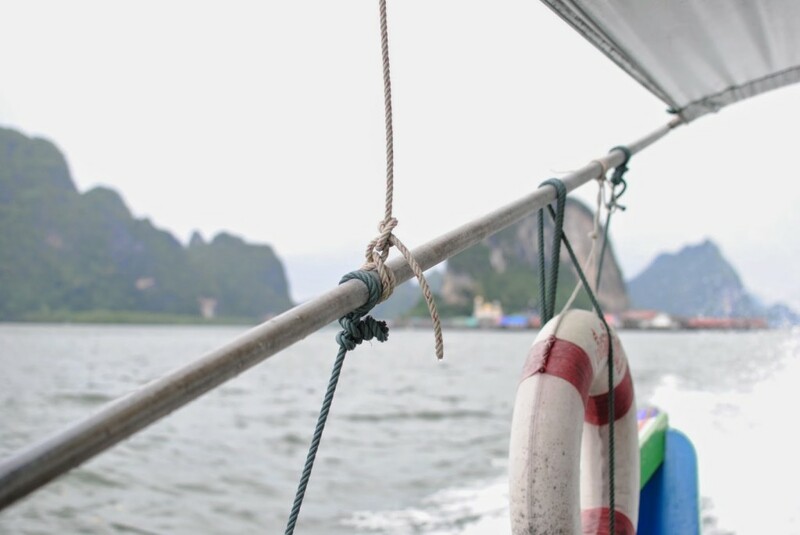 If money didn’t matter I might recommend going the route of a smaller chartered boat that leaves earlier in the morning just to avoid the crowds and get a more personalized experience. Had the weather been nicer we would have wanted to stay at each stop for a bit longer than our tour allowed. Let me know what your experiences have been with booking tour packages in the comments and feel free to ask for more information if you are interested in booking one! 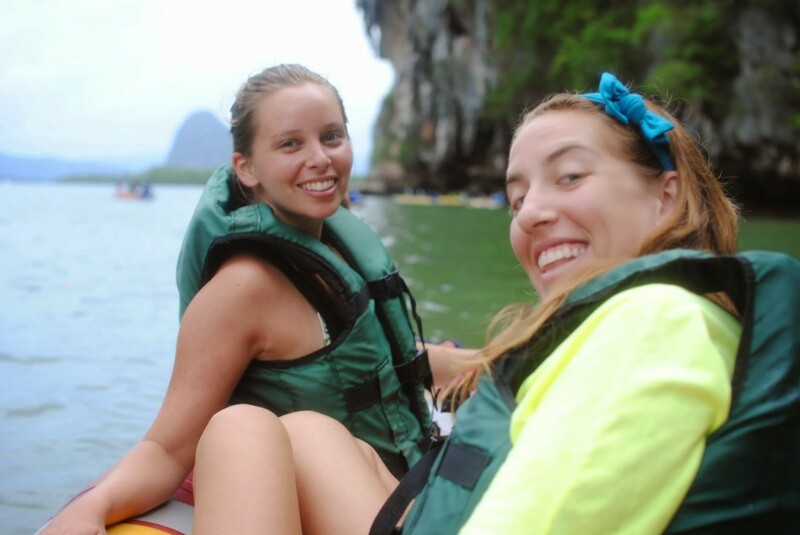 Looking for other activities to do while in Phuket? Check out the weekend market in Phuket town. 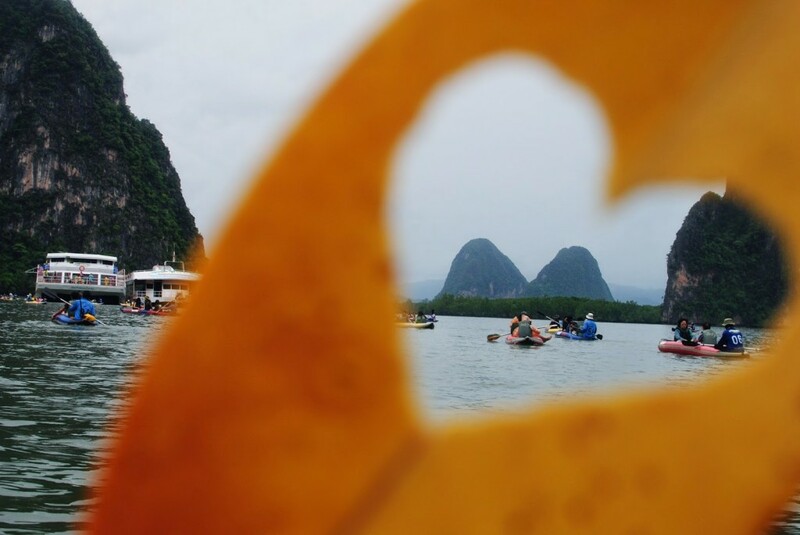 Want to give the east Thai islands a try? 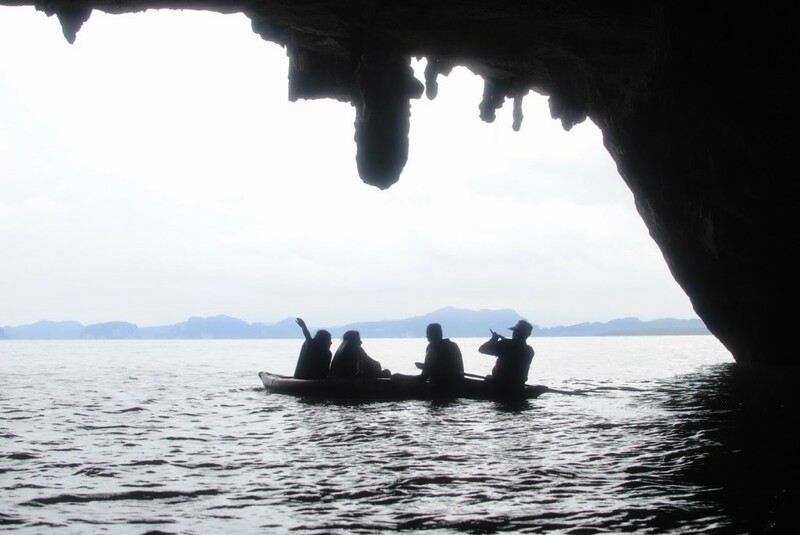 Koh Tao is great for snorkeling or scuba diving while Koh Phangan and Koh Samui offer up a lot of island adventures and nightlife.